Before Daniel Powers erected the Powers Building in the late 1860s, the site had been home to Hamlet Scrantom’s log cabin, the Eagle Hotel and Tavern, and the Powers Banking House. 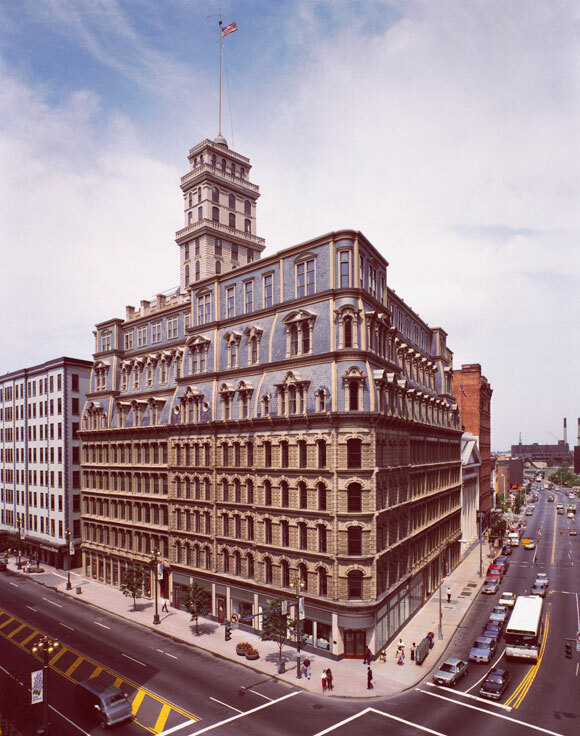 Originally a five-story structure, Powers had two additional stories added as well as a three-story tower so the building would hold its supremacy as Rochester’s tallest. 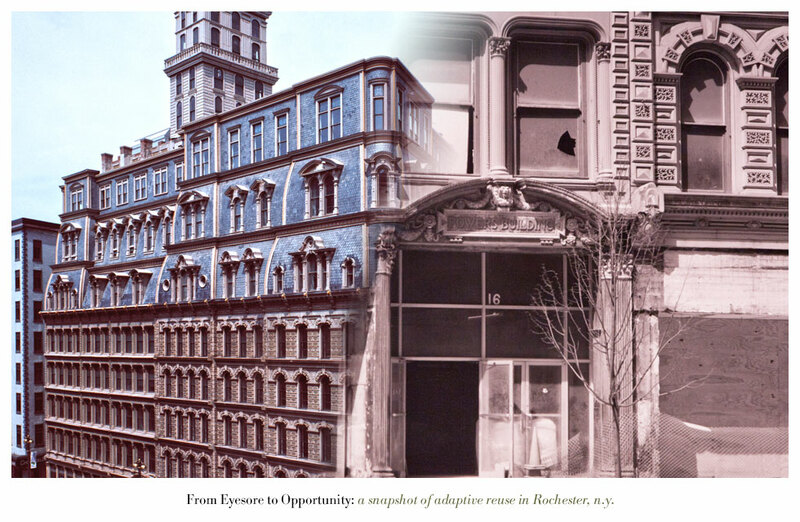 A century later the “Grand Old Lady of the Four Corners” had lost its luster and by the 1980s would sit largely unoccupied, deteriorating quickly. At least five separate efforts to rehabilitate the building failed before Value Properties Inc. (a New York City developer) bought it in 1988 for an estimated $400,000-$500,000, spent $20 Million restoring and renovating it, and reopened it in 1991. While the Powers Building could have easily been lost, today it is widely regarded as an irreplaceable Rochester icon. Richard Margolis photo-documented the entire restoration process. This “after” photo was taken in 1991 when work was completed. To get the perfect shot, Margolis stood on a 2-foot ledge outside a 4th floor window of the Wilder Building across the street. Thanks to Caitlin at The Landmark Society for the great information! And thanks to Richard Margolis for the death-defying photos!! This entry was posted on Tuesday, April 3rd, 2012 at 8:24 am	and is filed under Architecture, Rochester History, Rochester Images, Urban Development. You can follow any responses to this entry through the RSS 2.0 feed. You can leave a response, or trackback from your own site. This brings up an interesting question. How many of our current landmarks would be around today if we applied the same standards advocated by many of our most ardent preservationists? Scrantom’s log cabin was quite historically significant. The Eagle Hotel and Tavern was a nice piece of architecture from the couple of pictures I’ve seen. Would the Powers Building itself have been allowed to be built by today’s preservationists or would they have insisted on adaptive reuse and landmark status? I am not opposed to historical preservation. I live in a restored historic house in a preservation district and I’m a Landmark Society member. But I also believe in property rights and progress. And while I myself would prefer to see Cataract restored and reused and think that Genesee has been less than honest in this whole process I’m not sure that we do a lot for the cause by opposing demolition of nice, but not exceptional, buildings as part of a viable project. After all investment should be encouraged, even if it’s not a perfect plan. And vital urban neighborhoods are almost always a mix of old and new. Are we damaging the cause the next time someone wants to demolish a great old building that has fallen on hard times to create another parking lot or empty lot? Or the next time someone wants to demolish true architectural gems like the old Plymouth Spiritualist Church as part of a wholesale urban renewal style project? Doesn’t it become easier for the general public to buy the misinformed notion that preservationists are busybodies who oppose property rights and all development that doesn’t meet some kind of elitist ideal? Excellent point Bill. If Daniel Powers presented the city with a plan to raze Scrantom’s log cabin and replace it with 9 parking spaces you bet your sweet bippy I’d take issue with that. Especially if Scrantom’s cabin was on the DBHV list when he made his proposal. And especially if Mr. Powers’ plan was to build the Powers Building across the street and that plan had already been approved by the City. Full disclosure: I own property. And I’m not a member of the Landmark Society. Let’s try again. I really do have a genuine interest in the issues being discussed and have honest questions about priorities and methods and a different perspective. I did not mean to come off as antagonistic or dismissive, but perhaps I did and invited your sarcasm and dismissal? My honest questions – what are the circumstances in which you would support, or at least not actively oppose, (which is my actual position in this case) demolition as part of a larger project by a private builder? Not as some sort of urban renewal scheme (I’m not sure what new terminology is en vogue for “slum clearance” debacles these days) or simply “demolishing eyesores”? From a historical perspective – what about the many instances where older buildings were demolished, not for parking lots, but for carriage houses or other outbuildings for new buildings which are now landmarks themselves? Do you admit that these kind of campaigns can perhaps conflict with the larger goal of urban vitality and redevelopment? And might we not be better off focusing our efforts on eliminating the many government policies that encourage and subsidize sprawl and demolition, and increasing the incentives for adaptive reuse and sustainable urban development? Bill, honestly I wasn’t dismissing your comment. In all seriousness, there have been many demolitions since I’ve lived in Rochester that I have not opposed. In fact I’ve only opposed this one and one other, a 1880’s Victorian house/storefront on Clifford and Conkey where an individual wanted to buy it from the City and fix it up. Take for example Midtown Plaza. Lots of historical value there, but not a peep from me. Right? So why am I so opposed to the demolition of this one building when it is owned by a private company? Read my letter to the Preservation Board for a few reasons. Too many to get into in the comments section here. Let me know if you have questions. I wonder what was behind the whole scam back in the day of wrecking the RKO Palace?? ?…If that gorgeous place wasn’t enough to make you go…HHHHHMMMMMMM……nothing is safe.Europe does not do this kind of crap like we do “across the pond”.Great old quality “soul enriching” and built to last things in this country,go the way of (Hopefully) Sarah Palin,and cheap assed plastic/wallboard junk replaces it.Has to be a societal problem. Thanks for your informative commentary and the “before” shots of the Powers Building renovation. There’s a link to it from the Photographers Street View blog, where I try to capture Google Street View perspectives others may ignore. It takes some getting used to for us old folks to realize we don’t have to stir from our chairs any more to visit some very remarkable locations. Good to see you, Rochester, and congratulations on your successful preservation efforts!